MOJAVE AIR & SPACE POST, Calif. — When Howard Hughes took his wooden “Spruce Goose” into the skies it was the first and only time the vehicle lifted off the ground (or ocean as it were). 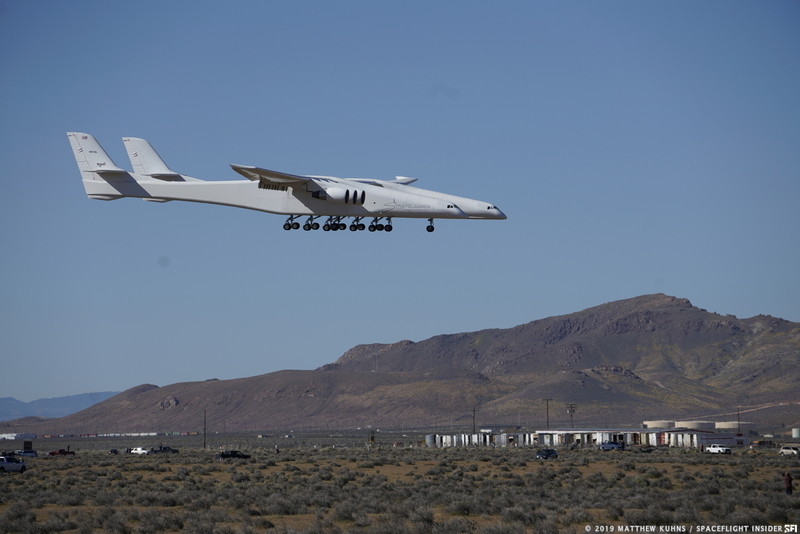 Saturday’s flight of the massive Stratolaunch aircraft will likely not encounter the same fate. At 6:58 a.m. PST (13:58 GMT) April 13, 2019, Scaled Model 351 took to the skies above the Mojave Desert, demonstrating that it was ready to ferry up to three Northrop Grumman Pegasus XL air-launched rockets. The Spruce Goose was flown only once, on November 2, 1947, and had the largest wingspan of any aircraft to ever take to the skies until Saturday’s flight. The Mojave Air & Space Port is located in California (the “Golden State“) and is the first site which is licensed to horizontally launch reusable spacecraft from. The following photos were taken by SpaceFlight Insider’s visual team and are courtesy of Michael Howard, Michael McCabe and Scott Schilke. If you enjoy our coverage and are able, consider supporting us on Patreon to help in our efforts to to bring you fantastic content about the space industry!